In May 2015, The Honourable Donna Martinson, Q.C., presented a paper entitled “Justice, not Just Access: Effective Outcomes for Children Children’s Legal Rights – the Fundamentals” at the Access to Justice for Children Conference – CLEBC in Vancouver, British Columbia. The paper begins with an introduction on justice for children and moves on to an overview of how the United Nations Convention on the Rights of the Child applies in Canada. This overview includes both a description of how Canada has implemented this convention and how this related to the Charter. The paper further goes on to discuss the Committee on the Rights of the Child, its role, the four general principles of the Convention and an evaluation of State compliance. It also analyses when children’s rights must be considered and what Canada’s obligations are under the Convention. This is a reminder that the Innovation and Access to Justice Conference is just a few weeks away – October 1 and 2. A few spots remain available and we are hoping to sell out. It is attracting a broad swath of interest from innovators across the legal community, ranging from government, law societies, legal aid, the private bar, PLEI providers and academics from across Canada. This conference is in Montreal for the low registration fee of $175 to ensure the conference’s accessibility. However, this will increase to $200 on September 28. The final date to register is September 29. It will not be possible to register in person at the conference. 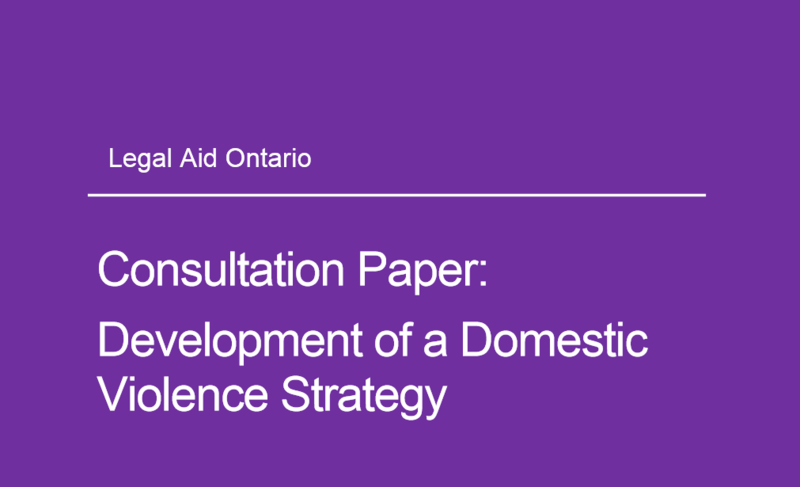 Legal Aid Ontario has just released a consultation paper on the development of a new domestic violence strategy. This paper will provide a starting point for discussion at upcoming consultation sessions. LAO is also inviting public feedback on the strategy. You can access the paper here.